NAUGHTY HAS NEVER BEEN SO NICE! For the very first time ever – the biggest burlesque legends from around the world are united on one stage as Britain’s No1 burlesque show goes global. It’s Vaudeville gone volatile: couture costumes, worldwide all-stars, an oh-so-steamy score and mind-boggling speciality acts explode onto the stage in the cheekiest show of the year. For four fantastic years it has exposed thrilled theatregoers to the art of burlesque. Playing all of Britain’s No1 venues, the sizzling spectacular has single-handedly founded burlesque as a mainstream art form in the UK. And that’s not to mention the international tours that have established An Evening of Burlesque as worldwide phenomenon! Truly unique – no other show comes close to its twirling tassels and laugh-out-loud tomfoolery – this year welcomes an all-new suspender-snapping production! As seen from Milan to Minsk, Zurich to St Petersburg, Helsinki to Verona, Dresden to Dessau. Packed full with all-stars from the four corners of the globe. 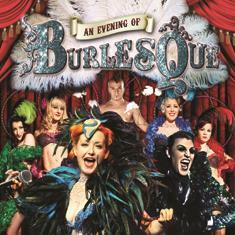 Join a thrill-a-minute, fun-filled frolic into the bizarre world of burlesque and cutting-edge variety. . . we dare you to come!